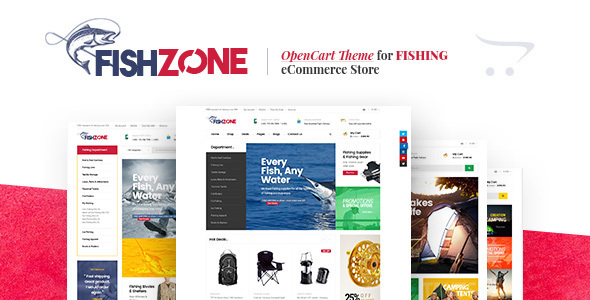 Lexus Fishzone is a an advanced Opencart theme designed for Fishing tools store, outdoors store with dedicated design and functionalities. Its layout is super flexible with 4 pre-made demos, multiple header styles, supports both Megamenu and Vertical Megamenu. The creative design allows you show off products and content in smartest ways. The Fishing tools store Opencart theme is built with Pav Framework 4 – powerful Opencart Framework and the outstanding Drag and Drop Page Builder to build stunning pages in minutes. The powerful filtering system helps user find their best fit products easier. The theme is easy to customize based on intuitive theme control panel with ultimate core features built-in: Theme setting, megamenu builder, live theme editor, CSS development, compression, etc. Lexus Fishzone is SEO friendly and optimized codebase to maximize your site performance.